Breed Group: Non-Sporting Weight:40 kgs Height: 56 cms Color(s): solid red, black, blue, cinnamon, and cream Coat: The Chow Chow has an abundant and profuse double coat that comes in two different varieties: smooth or rough. The fur is particularly thick around the neck area and resembles a lion's mane. The outer coat is coarse and is supported by a dense under coat. The most common coat colors are red, black, blue, tan, and gray. They are never parti-colored. Distinct feature: The Chow Chow is a true masterpiece of dignity and beauty. They possess the unique characteristic of having a blue-black tongue. They are keenly intelligent, have an independent spirit, and display a dignified demeanor. 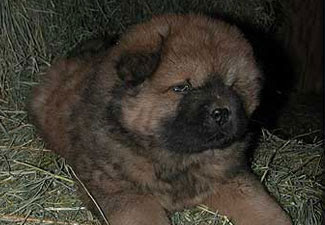 Temperament: The Chow Chow is most generally polite and patient. They are very loyal and friendly with their family, but exceedingly reserved with strangers. They most often will become attached and overly protective of one particular member of the family. Activity: They prefer to stay indoors where they are relatively inactive. They enjoy a small securely fenced yard, but cannot remain outside for extended periods of time in hot weather. They benefit from short daily walks. The Chow is well suited for apartment dwelling provided they are given sufficient exercise.